Thank you Cal. This 'war' between Ukraine and Russia is just like between North Korea and South Korea. It will never and. They took a vote to stay with Russia. I don't think they could win a war with Russia. Scary situation. I hope that all will work out well. 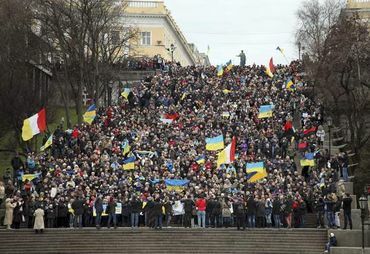 I hope the people of the Ukraine can hold their country together without the loss of life. Sacry, indeed! I think this won't be over for a long time. If the majority of the Ukraine decide to join with Russia then they should be allowed to do so otherwise the region will always be a thorn in their side. There is no war between Ukraine and Russia. Ukraine is dependent on Russian gas, and they signed The Budapest Contract 1994 with agreement of USA and UK that the Crimea can take uop to 25,000 Russian soldiers. Sewastopol, main harbour and seat of the Russian mediterranean fleet has always been Russian. Crimea was given to Ukraine in 1954 by Krushev, the same guy who knocked his boot at UN and promised to bury us. No referendum there took place. If Crimeans are not happy with Ukraine - they should be able to join Russia. Much to do about nothing. I Russia really wanted the entire country they could have has it in hours. Tztzt - strange how things work out ... when South Sudan broke off Sudan (under pressure from Uncle Sam) the "whole" political world was cheering on. Those who voiced opposition at how this vote came to life were told off and lectured on "democracy" ... was a good joke anyway. If the Crimeans wants to go back to Russia, the parliament voted on it and puts it to a referendum ... the "whole" political world is up in arms and shouts "foul" and against International Laws and what have you. If the Egyptians kick out their bearded puppet President who came to power through push and shove and rigging and faking ... then the whole world is up in arms, babbles about "democratic election and legitimacy" and whatever else comes to their mind - all in order not to loose yet another willing puppet. If the Ukranians are pushed to kick out their equally democratic elected President ... the whole world cheers on and puts the neo-Nazis in his place.